For the last three days all government departments in Kargil are closed as part of the protest against the government decision. Following mass protests and closure of government offices against the creation of a separate division for Ladakh with its headquarters at Leh, the Ladakh Autonomous Hill Development Council (LAHDC), Kargil has called for mass disobedience and directed all government offices not to entertain government orders unless the Governor reviews the decision. They have refused to be part of new division unless there is a six month rotation of offices between Kargil and Leh. All district offices in Kargil and Leh work under the Autonomous councils, and the resolution passed by LAHDC Kargil has created a serious challenge for the Governor's administration. The resolution says "establishing the headquarters of Ladakh division at Leh has hurt sentiments of the people of Kargil". It reads that it was unanimously resolved that the LHDC Kargil would strongly advocate to review and amendment of the government order for providing headquarters of Ladakh division on rotational basis. It says that LHDC Kargil has decided to spearhead mass civil disobedience against the Governor administration's order unless necessary amendments are made. The LAHDC also directed Deputy Commissioner Kargil that the government order about the creation of the division of Ladakh may not be entertained till necessary amendments are made into it. It said the LHDC Kargil will demand equal share for district Kargil in the establishment of directorate and administrative units. For the last three days all government departments in Kargil are closed as part of the protest against the government decision. 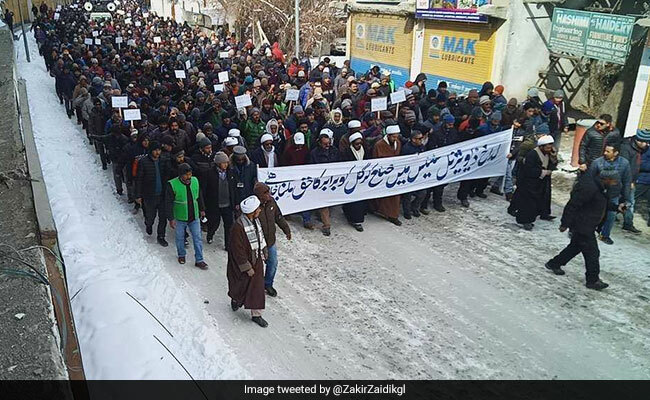 Despite extreme freezing temperature at minus 17 degree Celsius, thousands marched on the streets of Kargil and many even spent Tuesday night under the open sky. The protesters blocked the entry of newly-appointed divisional commissioner of Ladkah into Kargil and forced him to go back to Leh. Jammu and Kashmir is under President's Rule. The decision on separating Ladkah region from Kashmir division was taken less than a week after Prime Minister Narendra Modi visited Leh. The BJP had won Ladakh parliament seat in 2014 elections but suffered huge reverses after its local lawmaker and several other senior leaders from Ladakh resigned from party in November last. The party is desperately trying to regain the lost ground before upcoming elections. While the decision was welcomed in Leh, the party is facing revolt in Kargil. It has also led to demands for separate administrative divisions in Pirpanjal and Chenab Valley regions. The National Conference and PDP are strongly supporting separate divisions for these regions but the BJP has vehemently opposed it.